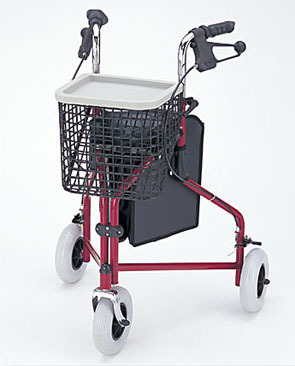 The Traveler 3 wheel walker/ rollator offers many great features in a 3 wheel walker with lots of added extras! The Traveler comes standard with front basket, food tray and storage pouch. The locking loop brakes and manual wheel brakes give added safety. This walker is light weight, at only 13 lbs. without basket, which makes it easy to store and transport. 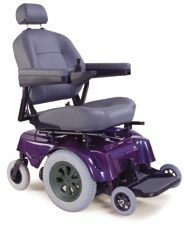 The large 8 inch solid tires allow this walker to easily travel over rougher terrain. The Traveler folds to only 10" which allows for easy storage in most any space. Tray, basket and tote bag included. Basket, tray and pouch included. Adjustable Height 31.5" to 35.5"